Named one of the 10 best books of the year by San Francisco Chronicle and Maureen Corrigan, NPR’s Fresh Air and named one of the best books of the year by The New York Times Book Review, NPR, The Washington Post, O: The Oprah Magazine, Mother Jones, Glamour, Library Journal, Kirkus Reviews, Newsday, Pamela Paul - KQED, Financial Times, and The Globe and Mail. Narcissistic, hilariously self-deluded, and divorced from the real world as most of us know it, hedge-fund manager Barry Cohen oversees $2.4 billion in assets. Deeply stressed by an SEC investigation and by his three-year-old son’s diagnosis of autism, he flees New York on a Greyhound bus in search of a simpler, more romantic life with his old college sweetheart. Meanwhile, his super-smart wife, Seema - a driven first-generation American who craved the picture-perfect life that comes with wealth - has her own demons to face. How these two flawed characters navigate the Shteyngartian chaos of their own making is at the heart of this piercing exploration of the 0.1 percent, a poignant tale of familial longing and an unsentimental ode to what really makes America great. Gary Shteyngart takes someone who none of us want to root for, a hedge fund manager who leaves his family to "find himself", and digs deep into his character as that character travels the US during the 2016 election. Barry, the protagonist, bumbles through this journey, showing just how out of touch he is with most of the country and with himself. At the same time, Barry's wife Seema is left to tend to their autistic child while she also starts to look deeply into herself. This book rewards us by helping us learn more about ourselves and those we may not understand or revile, and done in a humorous way. The novel is funny and sly. But I can't stand Arthur Morey's reading. I find his take on female voices borderline offensive. And his overacting is like fingernails on a blackboard to me. I know that he's popular with some and he certainly seems to get work, but when I see he's the reader, I pass up the audiobook even if it's something I am very interested in or by an author I like. Book club is reading Lake Success and I have a long commute so I broke down. But it is torture. Not one likable character in this book. Their actions don't make sense - a rich guy who buys expensive wines, watches, etc. decides to ride the Greyhound across the country and loves it. Most of the motivations seem made-up, not coming from some sincere spot inside the character. Nothing rings true. Very disappointing. I don't think the author understands human nature. This book came with a positive review from a critic who usually hits the mark for me. Unfortunately, the book was a far miss and was unnecessarily long and tedious. I have loved many of Shteyngart’s novels and enjoyed all of them. But I don’t understand all the positive reviews of this one which, to my mind falls woefully short. It’s a giant cotton candy novel - everything is too easy, too current and in the end it’s as meaningless and unsubstantial as Barry Cohen’s increasingly rehearsed accounts of his Greyhound travels. Linking the plot of the novel to Trunp’s Presodential campaign and the fate of Barry and Selma’s marriage to his victory is painful in its gimmickry. Again, I admire Shteyngart for his insight and humor normally, but this material feels derivative and light - a self-consciously exaggerated portrait of a privileged narcissist, no more. The real question for me is whether Shteyngart somehow sees himself In his frustrated main character? I’d hate to see Shteyngart descend into self—nbsorbed examination of what becomes, novel after novel, essentially the same character of flawed and frail masculinity. Somehow this novel reminds me of a late Woody Allen or Jim Jarmush film - with both directors putting together some of the best movies ever, yet sliding, over time, into a tendency to repeat the same type of situation (Jarmush) or cast of characters (Allen) over and over again. Well written, a little too melancholy. 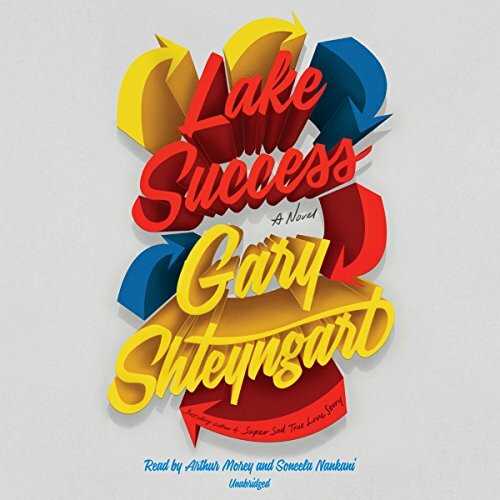 "Like your first ankle monitor bracelet or your fourth divorce, the occasional break with reality was an important part of any hedge-fund titan's biography"
- Gary Shteyngart, "Lake Success"
Like great Indian food, I'm not exactly sure why this novel works for me, but GOD this book was delicious. OK, so I know SORTA why it works. It is brilliantly absurd, and sharp enough to almost immediately, and almost painlessly, draw blood. I kept thinking that this novel was like a mirror presenting this ridiculous reflection that seems a bit freaky, distorted, and ugly. You think it is funhouse mirror from a carnival, but there is a moment of clarity when you realize the mirror is FINE. The reality is just that you ARE a bit freaky, distorted, and ugly. Shteyngart's novel arcs like Bellow's The Adventures of Augie March mixed with a bit of Kurt Vonnegut and Paul Beatty. While I can't say it was as literary or timeless as Bellow's Great American Novel of exploration and identity, it still hummed with some of that same wild, kinetic energy. 'Lake Success' contained only a few characters to love (Shiva, Jonah, Seema's father, and a couple others), but many, many to learn from. The obvious two are the protagonists (Seema and Barry). They are the super-rich, .01%, Lucy and Ricky, of America in the 21st Century. They aren't the protagonists we need, but the protagonists we deserve. And then there are the watches, and the pimp juice, and the crack, and the maps, and the sadness. So so much sadness. If I say anymore, I'll just f-it up and ruin the surprise and melancholy joy (No, no. Not joy really. Pleasure? Hell no. experience? trip? Maybe) that this novel was. Thank you Mehrsa for recommending it. This just wasn't all that interesting. Not what I thought it would be. After about 30 minutes, I finally deleted and will return for a credit. Certainly not worth spending more than 13 hours of my time. It's a great story, but the male narrator sounds much older than the character he's voicing. Barry is in his late forties though most of the story, the narrator sounds to be much older, at least his 60's and it really threw me off. Great story though.